For the same friend I made the potholders in my last post for, I also embroidered this little Matryoshka. Glad to say my friend loved both, potholders as well as Matryoshka! 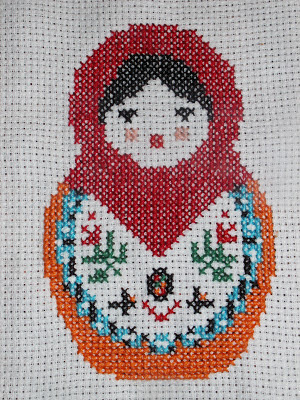 I changed the pattern a little bit, but the original pattern of the Matryoska I found at Oksana Plus Hobbies. 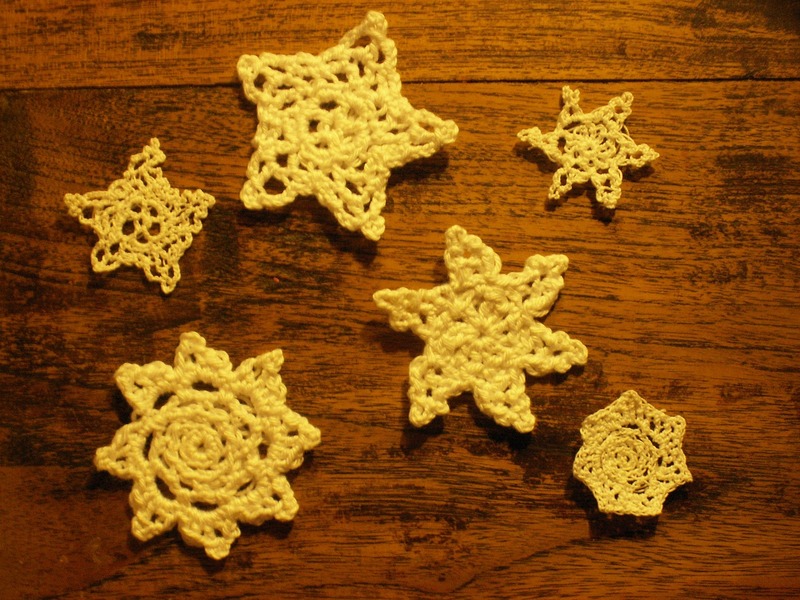 This week Q of JAQS Studio featured my Snowflakes! 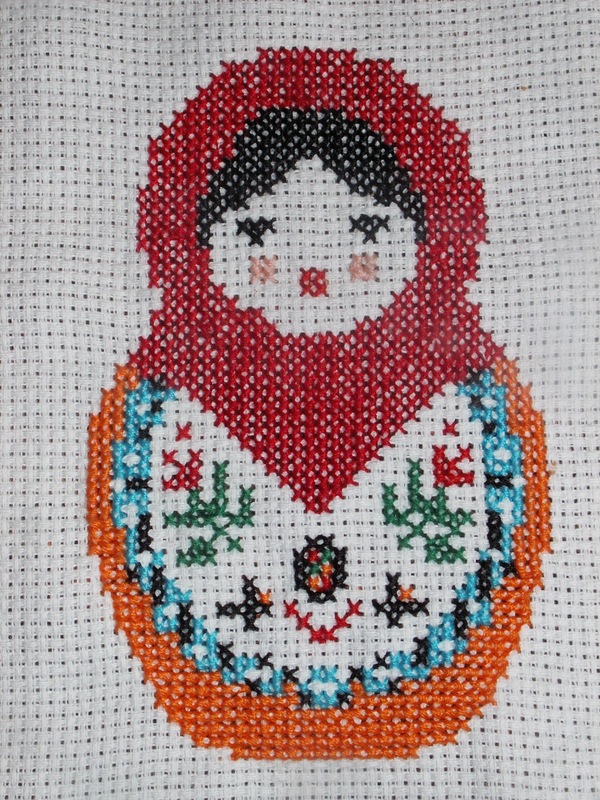 I have always admired those with the patience to cross-stitch, it looks great! Thanks for visiting and leaving such a nice comment, Elisabeth! Your embroidery is gorgeous. I wish I was as talented as you! Just putting a needle with thread in a little hole, you can do that, too :-) ! But thanks for the compliment! You definitely treat your friends very nicely. I have lots of them, but they never make me anything. That is okay, being a true fiend is what really matters. Very lovely. Nice you still have good eye sight to do such beautiful work. Haha, just let my eyes check and I'm still years away from wearing reading glasses :-) ! Thanks for visiting! fashion lady and pretty. Instead of a Tom Boy. Ha,ha. Thank you for leaving this nice comment! Gret job!!! I love how you changed the color combo! Thank you, Oksana! Glad I discovered this nice little pattern at your blog! I have always loved to cross stitch. I find it so relaxing! Happy Thanksgiving! Thanks, Jeanne! Hope you had a nice thanksgiving, too! I love matryoshkas. You did a great job on that one and it is so cute! I wish I had the time for cross-stich. I love this little lady! Makes me want to drag out my cross stitch and get back at it. Did you started yet :-)? Hope you want to show us the result when it's finished! Thanks for visiting! Hi, I’m Anne from Life on the Funny Farm (http://annesfunnyfarm.blogspot.com), and I’m visiting from WTFab. Thanks for your nice comment, Anne! Very pretty, congrats. I love these dolls! New follower. I love crochet and sewing and drawing too! Thanks for visiting and following me, Eve! Very pretty! Glad your friend liked her gifts! That's lovely! I'm sure your friend loved it. Thanks for sharing at Hookin On Hump Day! So lovely works!!! Love the matrioska! Thanks so much for sharing!